Michelle Barker has a master’s degree in education and works in education and the cycling industry. She, her husband, and their two boys (9 and 11) travel around the country visiting mountain bike destinations. 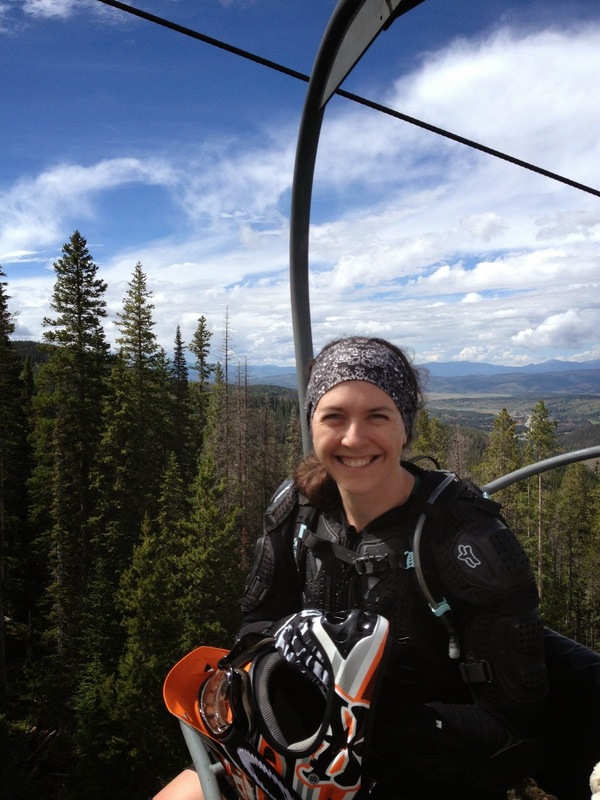 Michelle is the president of Linn Area Mountain Bike Association and a member of the International Mountain Bicycling Association’s Regional Leadership Advisory Council. She has been active in cycling advocacy for over five years; presenting at the Iowa Trails Summit, Iowa Bicycle Coalition Summit, and to various local government and nonprofit agencies. Michelle is also on the board of the Linn County Trails Association. I always remember having a bike as a child, but not much riding outside of around the neighborhood. Later, as a preteen, I rode my bike on gravel because it was the only way to get to my friends' houses! Then, I became involved in athletics and got a driver's license, and I'm not sure what happened to my bike. After college, I was reintroduced to bikes and bought a hybrid bike. Shortly thereafter, I began working in the bicycle industry and was introduced to mountain biking. That was nearly seven years ago, and my interest in mountain biking and singletrack advocacy has become my unpaid occupation and a key component to our family vacations and use of free time. Being in the woods is an experience I have sought out through hiking, camping, and later mountain biking. I ride now, and for the last years, because riding, specifically mountain biking, is now part of who I am. I ride now because it is an active way to spend time with my family, see new places, face challenges, and engage with my surroundings. We ride around our community to attend activities and events, to grab a bite to eat, and simply enjoy a beautiful day. Knowing that weather can temper mountain biking, I ride singletrack as often as time permits, solo, with friends, and with family, depending upon who is available to ride. To be honest, I simply want to ride and I want others to experience mountain biking! My favorite events are those where new mountain bikers can participate and learn. I've organized clinics for women, group rides, participated in clinics, and riding different trails with new friends is the best part of mountain biking. Mountain. I absolutely love singletrack, being outdoors, immersed in nature and the challenges that mountain biking presents. 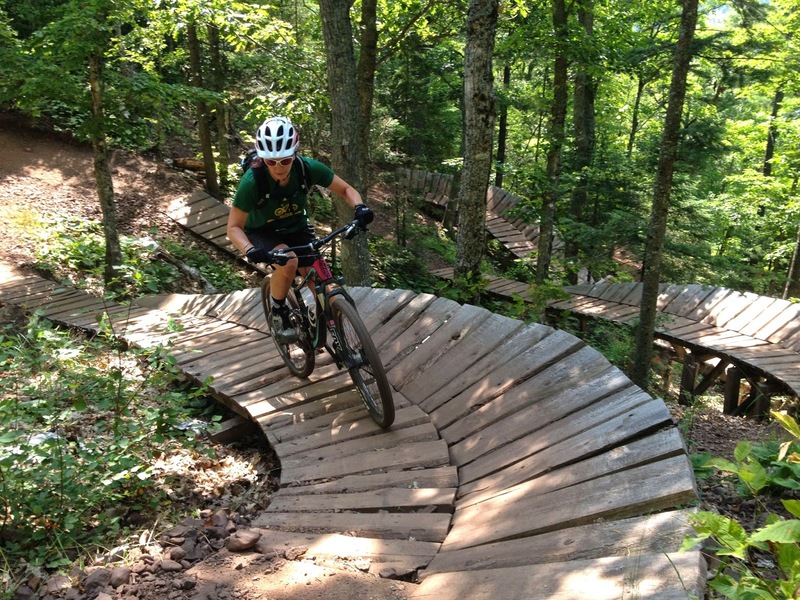 It doesn't matter if I am riding Iowa singletrack, backcountry trails, or lift served biking. The feeling of tackling a tough section of trail, or accomplishing that log/rock/climbing section that always presents a challenge, brings a smile to my face. Continuously learning new skills and improving upon those I already have means there is always something different. Because the trails are natural, they too are always changing. I was invited by some mechanics in the bike shop to try mountain biking. I borrowed a hardtail and rode clipless and had many reservations about my abilities and skill set. I have always been involved in athletic endeavors, so the athleticism component was not a concern. I crashed and tipped over many times, but the first ride ended with a grin on my face and the purchase of a used mountain bike shortly thereafter. The strong feelings of overcoming challenges and the satisfaction of each improvement hooked me to the sport right away. I fell many times that first ride, and that helped me to overcome my apprehension. I also walked some portions of the trail and learned so much in those initial rides. I still get nervous, on new sections and things that are more challenging, but look at it as a healthy feeling that keeps me riding within my abilities. I do try new things (I spent yesterday wearing a full face helmet, body armor and on an eight inch travel bike, riding the chair lift to the top of the mountain and then the bike downhill), but always strive to stay in my zone of proximal development. This is that area just at the edge of my comfort zone that pushes me to develop my abilities. There are times on new sections of trail that I will first walk a line and then ride it. I often ride flats if the riding is going to be more technical so that I can bail if needed. Also, there is no rule that says you can't get off your bike and walk a section if necessary. Don't ever let anyone goad you into riding something that makes you seriously uncomfortable. And I still crash from time to time, although I have learned many skills that lessen the number of crashes! Pedal use is dependent upon the type of riding. If I am riding a downhill type trails or highly technical trails for the first time, I like to ride in flats with downhill (sticky) shoes. This lets me bail if I need and makes it easy to session features or try new things. On my home trails and trails with lots of climbing, I prefer clipless because it is so much more efficient. If a rider is looking to try clipless, try it because you want to! Be prepared to tumble, practice clipping in and out, and don't feel that you can't return to flats! Flats are always an option and being comfortable on your bike and with your equipment is the highest priority. I commute sometimes. The biggest challenge I have had to overcome is facilities at my place of employment. The schools I have worked in don't have bike parking (but for students), and my option for showers, lockers, etc. was to share a locker room with middle school students. When I work at the bike store in town, there is ample bike parking inside, and a shared shower space. My new office for this next school year is at the forefront of bicycle friendly, with indoor locked bike storage, lockers, and showers! Cedar Rapids has been named a bicycle friendly community and I am completely comfortable negotiating the streets in town to get to my destination. There are obviously some roads that I try to avoid, and some that have heavy, fast moving traffic. Typically, less than ideal weather commuting is a result of having ridden my bike to work and then needing to ride home in rain, wind, cold, etc. Having the right gear is important, and the key is to be prepared and actually have the rain gear or cold weather gear with you! 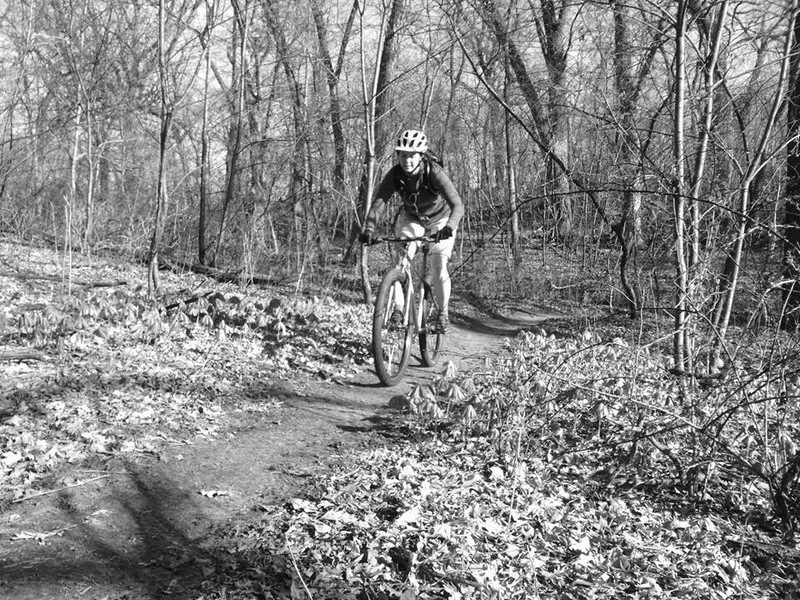 I really do not enjoy riding in Iowa winter cold, and very rarely engage in this type of riding. It is simply a huge challenge to find the right gear to keep my hands, feet, and face warm enough to want to ride. Yes! Some have had lasting effects and impacted my riding while others have been minor and simply delayed a ride. The "big" ones are the toughest. It might be due to something I've ridden one hundred times and then on that 101st time, something just doesn't work out! If I am left bruised and bleeding, it takes me some time to try it again. There are still some technical features I just don't feel comfortable enough to ride (skinny logs that are really high off of the ground)! The physical recovery has always been a let it heal, but keep riding mentality for me. The mental part usually takes the longest. I find that working back up to a technical skill and giving myself permission to walk if I'm not feeling it help me to tackle that cursed section/feature. A caveat is if I am traveling, I tend to push a bit harder because I'm not sure when I might encounter the trails again. What's not to love? The feeling of freedom is amazing, and the feeling of being in the woods, closely connected to nature invigorates me. Tackling a challenging obstacle, riding a little bit faster, and cornering tighter all leave me with a lasting feeling of accomplishment! To be honest, I can't even describe why I love riding my bike, I simply just do! Surly Crosscheck: I had this frame built up for cross racing, but now it is my utilitarian bike! Specialized Safire: This is my full suspension bike that has traveled to Canada and across the country. It is a bike I can ride in the Midwest, but has also handled Western riding and a various other terrain. Giant Lust 27.5: I won this bike, and so far love it! It climbs like it's nothing and is fun to ride because of its snappy handling and suspension for descents and obstacles. Independent Fabrication: This bike was bought from the fastest mountain biker in Iowa in the hopes that his speed would transfer with the bike! It is a rigid singlespeed and perfect for Iowa singletrack. This is the lightest and quickest bike I have and I am enjoying singletrack on a singlespeed. Specialized P.Series: Steel, singlespeed, dirtjumper. I bought this for use at places like Ray's Indoor Mountain Bike Park, and the future bike parks and pump tracks that will exist in Iowa! It is used for backyard riding and sometimes around town. Do you ride often with your husband? Has he introduced a type of bike riding to you or vice versa? We start at the trail head at the same time! My husband is more advanced than I am and has been riding longer. When we ride trails together, we often end up with him going first and waiting at key decision points for me. Sometimes, he will take a black or double black loop and I will wait at the next intersection, or if he wants to get in more miles, he will do a scouting ride at new locations and then organize our route for the next day. There are also rides where we simply stick together for the whole ride. At our local trails, we end up doing our own rides. When we travel as a family with our boys (10 and 12) we end up riding together. This last vacation, we were able to put our boys into downhill lessons and then get some riding in while they were learning. We met through mountain biking, and Ken has always done "trialsy" riding around town, in addition to mountain biking, and prior to meeting him, I had never heard much about trials riding. I ride primarily with my partner and will admit I been learning how to be a good student (I’m sure he’s having to learn how to instruct me as well!) Have you had any interesting/funny moments where the two of you got on each other’s nerves over riding? How did you overcome? My husband is notorious for leading epic rides! I am terrible with maps, so I always leave it up to him to evaluate the system prior to riding. Nearly any time we go out, Ken leads us on a great ride, but then adds a few extras, sometimes a trail or two, sometimes extra miles, extra climbs, etc. So, by the time you have hit your point of "done", you get to do extra trail! This has led to disagreements, but when you are out in the middle of the mountains near Sun Valley, ID or Mountain Hero in the Yukon, a disagreement won't get you back to the trailhead! I have learned that I simply have to muscle through until I am skilled enough with maps to take over navigation! A good pair of gloves. Full finger with just a little bit of padding. I wear these year round, on road or mountain rides and they lend themselves to great tan lines (which garner strange looks from nonbikers). These help keep your hands from fatiguing before your legs or lungs are finished! I have a bash guard on my Safire and this has saved me from countless chain ring tattoos and grease marks. I recently demo'ed a bike with a dropper post, and decided that is an investment I will be making in the very near future!